It doesn’t happen every day but there are times when you are fishing for trout and you catch a very respectable plump 15 inch rainbow that puts up a good fight and you say somewhat disappointingly, “Ahh . . . he is only 15 inches, but he fought well for his size!” That is code for “aw shucks, he isn’t nearly as big, fat, and strong as that 21 inch rainbow I landed just a little while ago or the one that just broke me off a half mile upstream. But I should probably be happy landing fat 15 inch rainbows.” It is an envious position to be in and the exact scenario I had for the past 3 days fishing on our roadless section of the Grande Ronde River. Fishing on the Wallowa and Grande Ronde remains decent in late summer if you fish the right areas of the river with the right kind of flies, but it certainly slows down from the peak fishing in late spring/early summer. 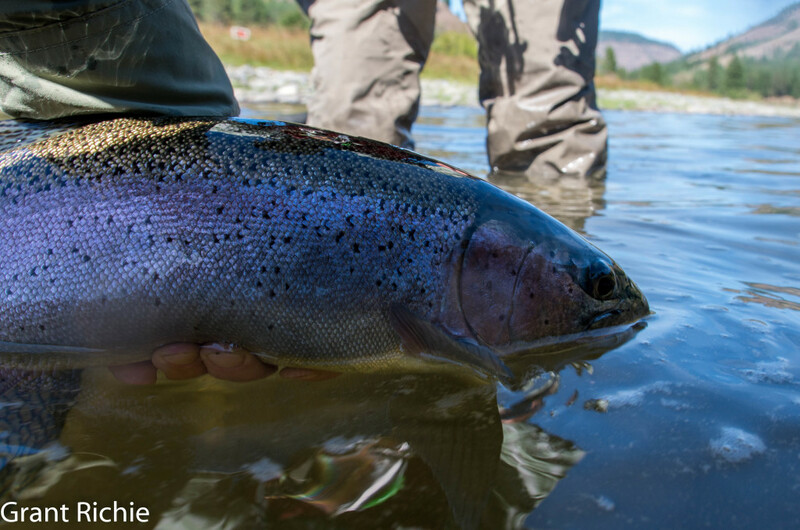 Beginning in the second half of September the trophy sized rainbow fishing can get pretty hot though. The combination of a little rain and cold nights turned the rainbow fishing from good to excellent this past week. Ben Swaner from Walla Walla joined me on the trip. Ben won the PacBay Quickline switch rod drawing from last years switch rod give away and I told him before we started the trip that catching big fish with the new rod was a requirement, not an option. I had done my best to give the rod some fish-catching mojo as I built it and everything aligned for 3 days of excellent rainbow fishing. Ben landed quite a few nice rainbows on the Wallowa and had one on that he estimated at 24 inches that he did not get landed. It was probably an early steelhead. I did not get a look at it as I was trying to beach the raft while he fought the fish. Once to the Grande Ronde we began working over some of my favorite low water runs and in one I hooked but did not land what I also believed to be an early steelhead from the size of the flashes I saw and the big heavy head shakes, the calling card of steelhead. I bought a net this year that has the length marked out on the inside and we tried to net most of our fish so we could get an accurate measurement and not tell fish stories. There were several fish landed at 21 inches, with several more right at 20 inches. Legally, a rainbow over 20 inches is considered a steelhead but I think these were just our big resident Grande Ronde rainbows. October Caddis became more abundant as we worked our way downstream and although the hatch hasn’t gotten under way heavily on the Wallowa, it is in full swing on the Grande Ronde River. If I didn’t love catching huge fish on streamers so much, I might have tied on an orange Stimulator or Hedgehog to see if the dry fly fishing has turned hot but I was having too much fun catching huge fish on streamers and stonefly nymphs. This year I have consistently seen the mountain goats on the big sweeping left hand turn below Alder Creek and again on the rocky bluffs on river left above Martin’s Misery, but the goats are moving this summer probably looking for greener pastures so to speak. We saw six goats including a kid on river right upstream of Alder Creek and another small band of three goats two bends down the river. A last goat was spotted Sunday morning from camp as I looked back upstream at the ridge leading down towards Bear Creek. 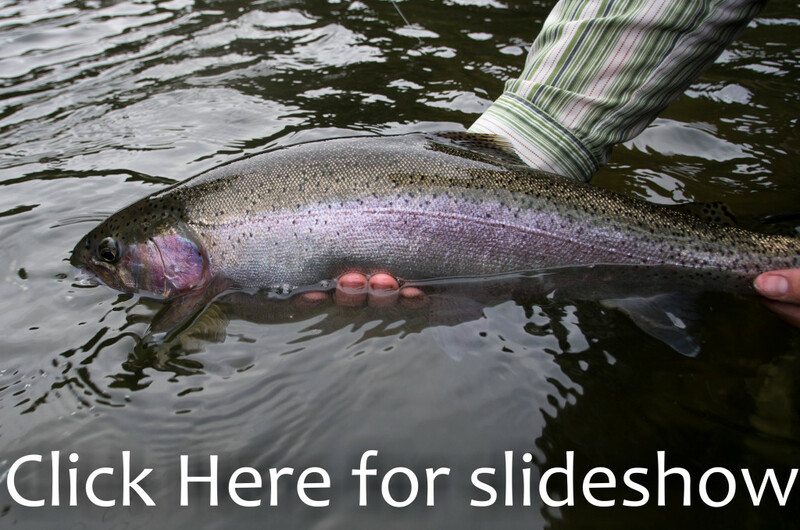 Keep your eye out on your next float down the Grande Ronde. I always enjoy seeing them whether they are way up the ridge, or down close to the river. 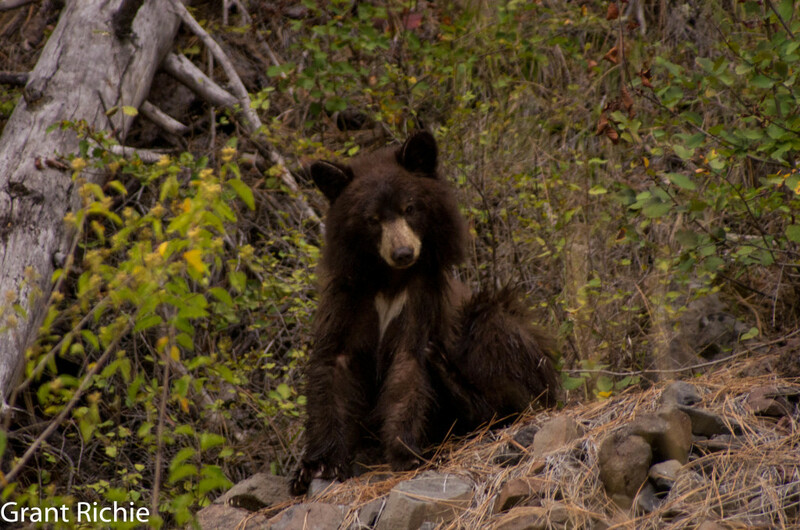 Saturday night we spotted a little brown colored black bear beside the river who either didn’t see us or didn’t care. His main concern seemed to be a terrible itch he had to take care of and then meandering up the river to eat some Elderberries. I took lots of pictures from the boat, but when he decided he wasn’t in a hurry we beached the boat across the river so I could get out a tripod and try to get some really good shots. Getting out my tripod usually signals the animal that I am trying to photograph that it’s time to take off and so it did this day as well. The little brownish colored bear was happily eating berries when a grouse flew out of the tree and sent him scurrying up the hill just as I was getting ready to set up my tripod for a good shot. I was still happy with the shots I got. Thanks to Ben for back rowing slowly and quietly near the bear’s side of the river otherwise I wouldn’t have gotten nearly as good of a picture. Since the October Caddis hatch started at the beginning of September I have been spending an hour or so each night in the dark at Minam with a flashlight and a macro-lens in hopes of catching a pupa crawling out on a rock and hatching. I have come close several times at Minam finding a wet trail, an October Caddis shuck, and a freshly hatched adult but failed in witnessing the emergence so far on the Wallowa. The hatch on the Wallowa is still so-so and will peak in October, but the hatch on the Grande Ronde might as well be called the September Caddis hatch because the big orange bellied bugs are hatching in full swing. My limited knowledge of the October Caddis hatch comes from a very good bug book for fly fisherman called Bugwater by Arlen Thomason. If you don’t have it and want to learn something about the bugs we try to imitate with flies, get it. The excellent photography is worth the purchase alone. Arlen’s observations on the river and his research of the scientific literature has shown that October Caddis hatch at night, 1-3 hours after dark in his own experience. This fact has made me dubious of fishing October Caddis pupa patterns since the pupa are likely not available to trout at all during the day other than a few unfortunate bugs who fail to hatch properly. But these bugs that don’t hatch properly, of which I saw several, do not look much like the October Caddis patterns available in fly shop bins. Our camp at Elbow Creek on Saturday evening was a great place. First we had a first rate sunset to watch. Then one hour after sunset I again went down to the river with my flashlight and macro lens. The caddis were already in full swing hatching though and there were fresh, wet shucks with newly emerged caddis sitting all over the rocks. At first Ben and I tried walking back and forth on the shore in the dark looking closely in the water for a swimming or crawling October caddis pupa that was about to crawl out on a rock. This system was timed perfectly wrong as every time we would look away from a rock and come back there would be a freshly hatched caddis that we had missed. I began waiting and watching one rock for several minutes at a time but would get anxious, knowing that there was probably 2-3 caddis hatching just out of sight and so I would go on the search again only to come back and find another freshly hatched caddis had appeared while I was checking the other rocks. We came close a few times and I shot photos of half-emerged caddis making the rest of their way out and then I saw a little orange guy swimming circles trying to grab ahold of a rock. I finally photographed one from the time it crawled onto the rock to full emergence. Having caught one full sequence on camera I gained a little more patience and began sitting and waiting at a rock that the caddis seemed to really like crawling out on. After spending a lot of time watching I decided to shut off my flashlight to see if that was keeping them from coming out. Upon turning my flashlight back on I found two caddis had crawled out and started to hatch. I played this game for over an hour, trying to catch them and finally got several good photo sequences showing the full emergence. 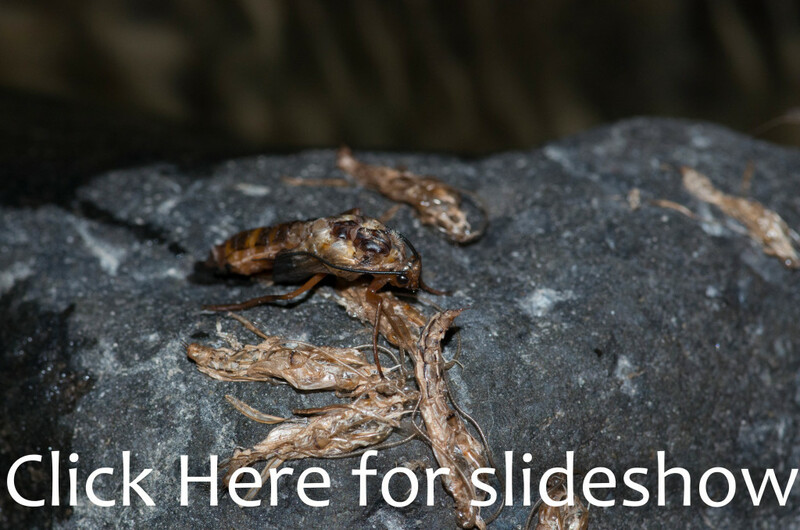 Click on the picture below to see a photo album of several different caddis emerging. What I can gather from this night’s observation is that most of the October Caddis must have been crawling out and not swimming. I should have seen more than one swimming pupa if most of them were swimming. 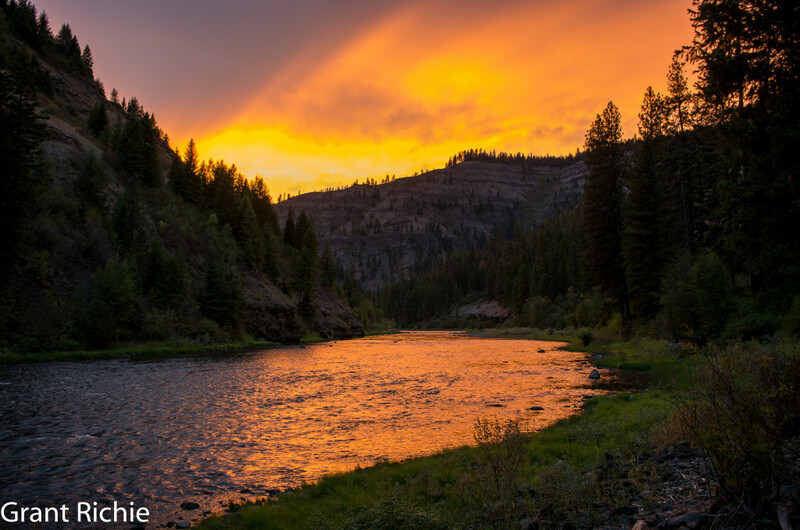 The hatch also began well before one hour after sunset this September day on the Grande Ronde. Next trip I will start watching as soon as the sun sets. I almost forgot to tell you about some of the best flies this weekend. 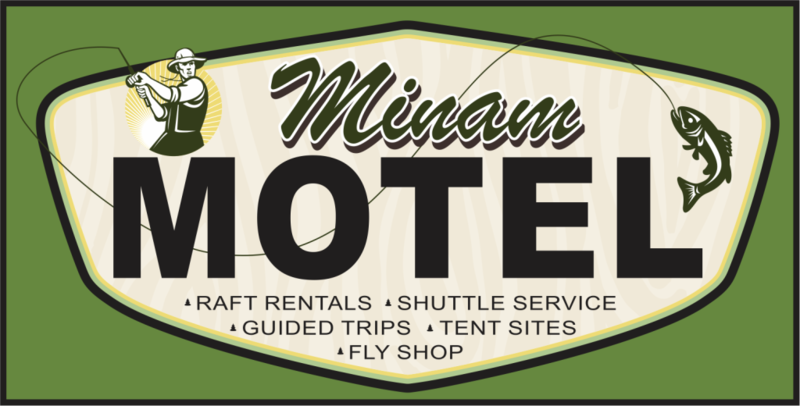 I still haven’t had time to tie any of my own flies and patterns so I have once again been using flies that we are selling out of our store here at Minam. This weekend’s hot patterns were Dali Lama’s (Olive over white), Sculpzilla’s in a size 4 or 6, flashback stoneflies, and Pat’s Rubber Legs. Did I mention Ben caught a sculpin (the actual fish) on a Pat’s Rubber Legs? I have never seen nor heard of anyone catching a sculpin on a fly. Just goes to show how unstoppable the Pat’s Rubber Legs is. 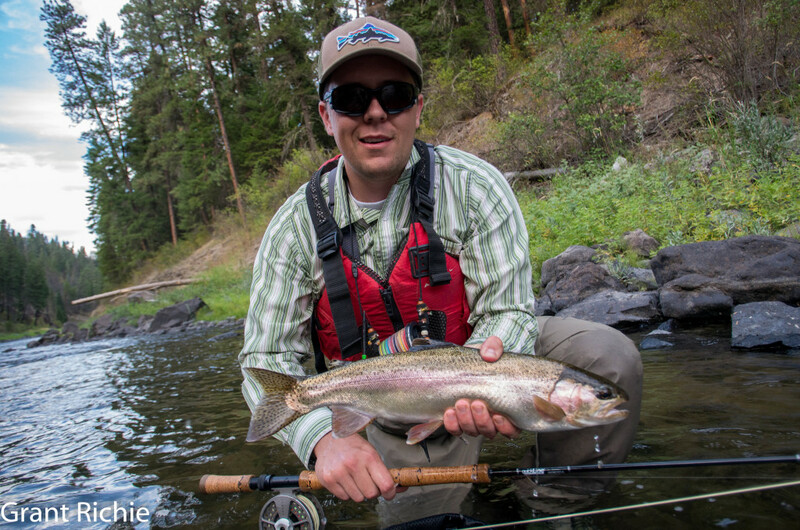 Coming back to the Who needs Alaska title—who needs Alaska to catch big rainbows? I don’t and you don’t either. Rather than paying too much money on a guided trip to Alaska to catch big fish, check out our guided trips page on our website and then shoot me an email either about a guided trip catching big rainbows now in a fantastic setting or about catching Grande Ronde steelhead in October and November. Either trip is a fantastic experience. You can take some of the money you saved and buy a new rod for yourself. As usual, click on the picture below to see a slideshow of pictures from this weekend’s trip. 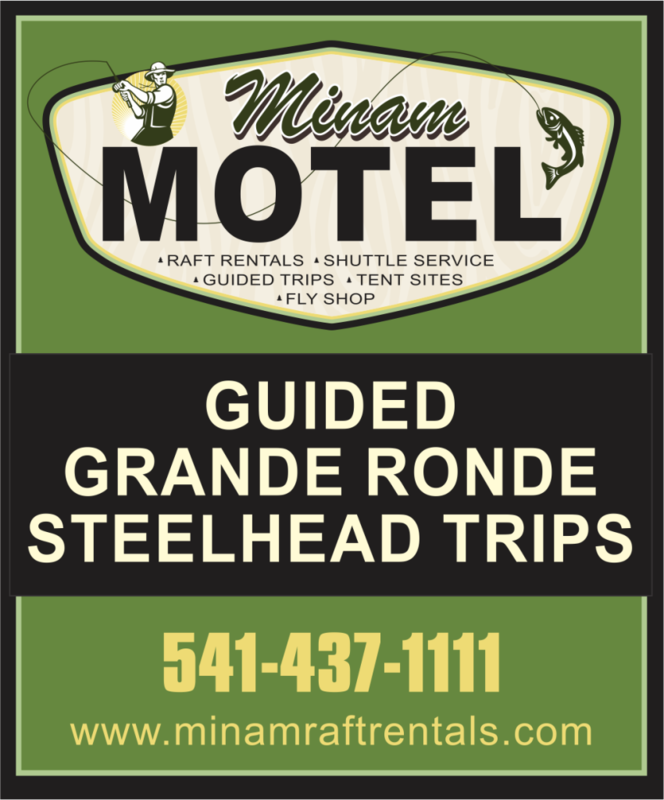 The Grande Ronde is pretty well abandoned by boaters once low water hits, so no problem with campsites. It is usually like having a private 40 mile roadless canyon to yourself. Pretty tough . . . The first half of September can fish pretty good also, but better chances of getting a bump in river flow and some early steelhead later in September. I like all of September really. Just remember it is skinny water. Pack light if you don’t want to get stuck very often. The great fishing, great weather, and awesome roadless canyon is worth any extra effort in rowing for me.